Kifissia (Greek, Modern: Κηφισιά;, Katharevousa: Κηφισσιά;, Ancient form/Latin: Cephissia) or Kifisia is a northern suburb of Athens, Greece, accessed from Central Athens by Kifissias Avenue, which runs from east of Athens up to Theseos Avenue in Nea Erythraia, which is named after this area. It has a city surface train station (ISAP or the Green Line), which is presently a part of Athens Metro. The Kifissos river is west of Kifissia. Half of the municipality is taken up by part of Penteli mountain. The rest is made up of urban areas in the west, and it is surrounded by popular areas such as Kefalari and Politeia to the North, and Nea Kiffisia to the south-west. Kifisia is one of the posh suburbs of Athens. One of the oldest too. Huge trees, beatiful villas with spacious gardens, makes Kifisia a great place to stroll about. The place has become quite popular with the nouveau riche lately and many of the beautiful original villas have given way to maisonettes but there are no tall buildings there so that is a plus. Kifissia is a popular hangout for people of all ages (but mostly teenagers) from all over the Attica region because of its many available forms of enterainment, such as the Cinemax Cinemas, the Kifissia Bowling Center, a shopping mall as well as many smaller individual brand name shops. It is also home to Kefalari Park, the most popular place for younger groups of people to hang out in and meet people. Apart from the various restaurants, cafes and bars, there are also several nightclubs, and all this makes Kifissia a thriving centre of entertainment all week long, any time of day or night. The easiest way to get there is by metro, the Pireaus-Kifisia line. The line ends there so it is easy to find. Kifissia, as Cephissia, dates back to ancient times, along with the ancient municipality of Epicephesia. It was the home of the dramatist Menander (circa 342-291 BC). Kifissia became a famous resort of philosophers during the reign of the Roman emperor Hadrian, when the wealthy Herodes Atticus of Marathon, Greece built the Villa Kifissia. In his Attic Nights, Aulius Gellius describes the unique ambience of intelletual ferment and aristocratic leisure in an idyllic setting which he created there. It was also the practice of Herodes to provide free instruction in philosophy for selected youths from Athens. The remains of the some of his family funeral monuments lie at the centre of the town in Platonas Square. He also beautified a sanctary to the Nymphs in the ravine of Kokkinara, in the nearby district of Kefalari. The history of Kifissia during the medieval period is obscure, but the remains of a monastery church dedicated to the Virgin of the Swallow (Panaghia Chelidonas)is associated with a story about a battle fought there between local people and unspecified "invaders". This chapel is a rare example of a monastery church originally provided with a fireplace, for the chimney remains. During the Ottoman Period, in 1667, Kifissia was visited by the Turkish traveller Evliya Tchelebi. He described a small country town set in a fertile plain of paradisiac beauty, with three hundred tile-roofed houses. Half the inhabitants of the town were Muslims and half were Christian. He records that there was a single mosque, without a minaret, and many small Christian chapels - some of which survive today. The temperature in Kifissia tends to be significantly lower than that of the city, so following the independence of Greece, it quickly became a summer resort of the ruling class of the new state. During the winter it snows there regularly something that does not happen in the center of Athens. Although its popularity faded somewhat during the middle of the nineteenth century when the danger of raids by brigands who infested the nearby mountains was very real, the suppression of brigandage, and the arrival of the railway in 1885, led to the dramatic development of the area. It became the fashion for wealthy Athenian families to build summer houses in Kifissia, and keen social competition led to the creation of a unique architectural ambience, as villas in ever more exotic styles proliforated. For those unable to afford a summer house, many hotels were built, where the slightly less affluent could spend the holiday months rubbing shoulders with their social betters. The heyday of Kifissia was probably during the inter-war period, when the leaders of the two main rival political parties frequented different hotels in the town together with their most important supporters. Following the liberation of Greece from German occupation in 1944, the British Royal Air Force ill-advisedly made its headquarters in Kefalari, taking over several hotels. With the outbreak of the Civil War, the RAF personnel were first besieged, then forced to surrender, and marched across the mountains into northern Greece; being released in Trikala only after a truce had been arranged. 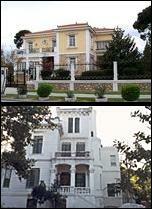 Today, Kifissia is an upmarket shopping centre, although many villas have been preserved. Every year, Greece surrenders to the arms of spring. Of the various botanical shows that take place, the Kifissia Flower Show in northern Athens is the most spectacular and longest-running. The show is home to over 50 different species of roses, camellias, hydrangeas, gardenias, tulips, daffodils, hyacinths, chrysanthemums, gladioli and dahlias. Rare and exotics species join an astonishing array of flowers and indoor/outdoor plants from all over Greece. Although the majority of exhibitors are from Attica, there are producers from regional Greece too, mainly from Volos and Thebes. More than 120 flower growers take part, together with the likes of the Embassy of the Netherlands, the Vienna University Botanical Garden, the Balkan Botanical Garden in Kilkis and the Stavroupoli Botanical Garden. More than 100 stands offer advice on how to transform your home, garden or veranda into a floral paradise, and the show also features gardening books, pots, pesticides and a programme of informative and entertaining events.